SPIN Selling teaches us the same lesson as a GPS: the best way to get where you want to go is to ask. Instead of figuring out how to get there, you scrap the printed maps, guesstimates, and wrong turns. And you just ask for help. This simple action makes your path completely clear. In this case, the path is turning a prospect into a customer and crushing your quota. Hit your quota faster with these easy tools that live in your inbox. SPIN Selling is a book that was first published in 1988 by Neil Rackham. It’s all about asking questions. And it’s very tactical. It teaches you how to lead conversations with customers. You transition through four different types of questions: Situation, Problem, Implication, Need/Payoff. Conversations in which sellers mostly listen and buyers talk lead to the highest close-win rate. It’s the heart of consultative selling. And sounds like common sense, right? But practicing it is uncommon. Because we defer to what we’re familiar with. Sellers know the ins and outs of their product or service and how it benefits customers, so they dive right in. Buyers are busy managing tools and services and spending too much time on that issue you plan to solve. And you have other calls and meetings back-to-back. So you cut to the chase. Because the fastest way from A (your conversation) to B (booking the deal) is to jump right into the solution. You need a 360° view of where they are. Otherwise, you won’t understand their pains versus your average customer’s or their immediacy. It’s worth putting in the time now to listen so you can better allocate both of your time going forward. Sometimes SPIN means finding out they aren’t qualified. Or that they went through this buying process a year ago but broke their contract with a competitor. 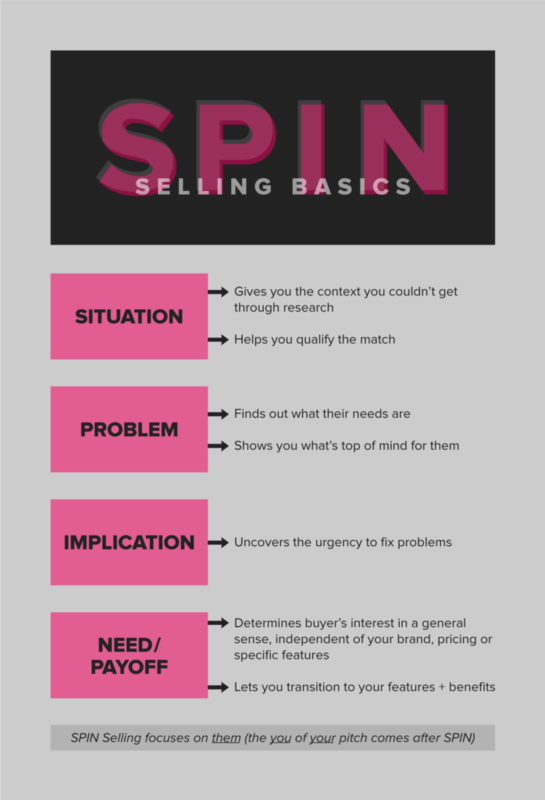 Every time, using SPIN Selling properly means whittling your pitch to exactly what they need. Try this Google Docs template for your calls to ask & log exactly what you need. But before we get there, there are some important ground rules. SPIN Selling is a blueprint, not a bible. One size does not fit all. The time you spend on each letter of S-P-I-N (and whether you need to cover every area) depends on where your buyer is at. Listen to their words, tone, and schedule. This technique works best when your prospect isn’t aware of the full scope of their problem. If you can help them understand implications they haven’t thought of, do so. This book is three decades old, which means we have to factor in customer evolution. Many buyers self-educate before scheduled calls. They’re often acutely aware of their own problem and needs. This may mean your time spent on Problem and Implication is more information-gathering than educating. You need to research them before the conversation to get everything you can in advance. Asking questions you could have found answers to implies that you’re lazy and they’re not a priority. The meat of your conversation should focus on the P-I-N. SPIN is not intended to be used as a checklist of questions. In fact, I promise you it won’t work if you use it that way. Buyers can read right through that. You need to wrap your questions into a natural conversation. For every question that you ask, really listen to their answer. Don’t just “mmhmm” and then move on. Reply with something meaningful to show that you’re digesting what they say. It could be validating their frustration, clarifying, or sharing a similar customer situation. Do cater your conversation to the answers they give, but be aware of the time, and keep an agenda. If they’re giving you valuable information, schedule a follow-up meeting for the rest. If they’re getting offtrack completely, reel it in to stay on track. Here is an agenda to help you log notes during calls. SPIN covers the first two, setting the stage for you to get to the second two (demo & close). Cortisol is driven by negative emotions. It shuts down the thinking center of our brain. This causes us to become more sensitive, defensive, and to perceive greater negativity. Oxytocin is driven by positive emotions. It increases our ability to trust others, communicate, and collaborate. Now, separate out the two types of selling. There are 1) sellers aggressively pushing their own agendas, and 2) sellers asking genuine questions. Look at the study finding below. 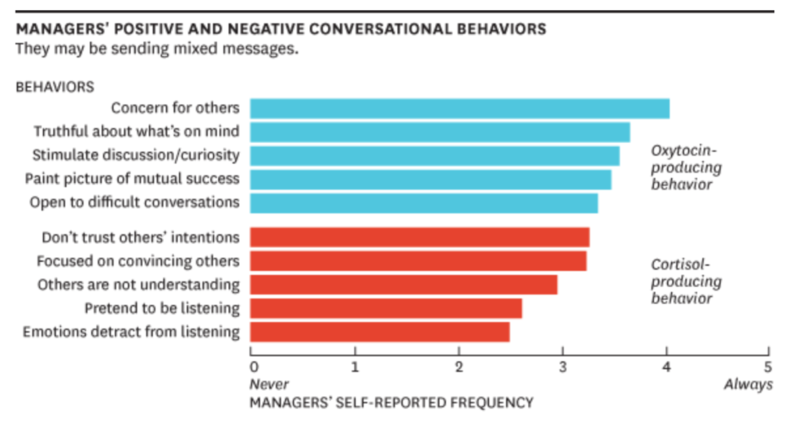 It’s based on managers and their reports. Keep in mind that the same behaviors relate to sellers and buyers. Notice how the red and blue behaviors line up with the two types of selling? The behaviors and beliefs that produce oxytocin, like “concern for others” and “stimulates discussion/curiosity,” relate to SPIN Selling. Now flip that and look at it from the perspective of the buyer. When someone is interested in you, it causes you to be truthful about what’s on your mind. But when someone pushes you into a corner with their pitch, you shut down. You don’t trust them, and instead focus on how uninvited their presumptuousness is. Situation Phase: Learning more about their current resources, process, and results. What to do: Explain that you want to run quickly through where they’re at so you make the best use of their time. Ever heard of pacing and leading? You set the pace of a conversation by starting where they’re at. Basically, you mirror their language and voice tone to gain rapport. From there, you start to change your behavior and they follow. In this case, you’re asking questions and they stay in line with you, answering where you guide them to. This leads them toward the ultimate solution that you will introduce. Moreover, research shows that talking about ourselves activates the reward center of our brains. Study participants gave up money to share about themselves; that’s how important it was to them. Questions give you the information you need and buyers the opportunity to talk. Problem Phase: Using subtle techniques to get them to point out the issue on their own. Often times, we have pain points that subconsciously bother us. Or we know a piece of the problem that’s staring us in the face, but we don’t think about every aspect to it. Asking questions helps them figure out they have it on their own. You’re a stranger to them, and instinctively, we don’t trust strangers — but we do trust ourselves. Instead of trying to convince them, this technique makes them their own change agent. Studies show that it’s hard to know for sure whether others agree with us. It’s called the false consensus effect. Asking them questions avoids this problem by getting direct feedback. Implication Phase: Helping them to see the web of negative effects from their problem. This way, they reach for the solution rather than you pushing it. Need / Payoff Phase: Leading them to identify the benefits of a solution. If you’ve done it well, they’ll be telling you the benefits of your product/solution without realizing it. Many buyers today are aware of the problem — convincing them isn’t the challenge. It’s helping them convince their boss. The best thing you can do is help them sell upwards internally to the final decision-maker. Before you jump into the details of your solution, learn more about their hurdles. If they need to get buy-in, plan to follow up with an email laying out the situation. And let them know while you’re still on the call that they are welcome to forward the email you’ll be following up with. This email should: exacerbate the need, the implication of lost dollars and time, and the ROI of your solution. Case studies give social proof. They show your buyer that their peers trust you and have seen the same results they need. It’s also helpful to give your contact access to your tool so they can become an advocate for you within their company. Don’t treat the questions above as a checklist. Do identify the ones that make the most sense to your business and your prospect, and work them naturally into your conversation. Practice makes perfect. Block off some time with a peer or your manager to roleplay a call. That way, you’re on the spot like you would be with a real prospect. Ask a more tenured peer to shadow a few of their calls so you can see SPIN Selling firsthand.